Nov 2019 - Jurassic Lake Hosted Trip - NOW FULL!! Since 2012, we have been annually visiting this unique fishery with hosted groups. It is, without a shadow of a doubt, the best wild trophy rainbow trout fishery in the world. Estancia Laguna Verde is the finest and most complete lodge operation on the world-famous Jurassic Lake (Lake Strobel). Located on the southern coast of this huge Argentine lake, the Estancia offers fishermen the chance to experience some of the largest rainbow trout in the world as well as beautiful, rugged and untouched landscapes in one of the most remote areas of Patagonia. In a part of Patagonia that is considered very distant and removed, this is far and away the finest option for great guides, huge fish, and very comfortable amenities. 30th November to 7th December 2019 - This trip is now fully booked. Andrew Fuller is the owner of The Flyfisher, one of Australia's largest fly fishing retailers. A fly fishing tragic for most of his life he is a veteran of numerous fly fishing adventures. Andrew has travelled to South America on numerous occasions and ranks his trip to Jurassic Lake as one of the best fly fishing trips of his life. Andrew can be relied upon to keep a calm head in any situation so he is a perfect host for your trip plus his luggage resembles a mini-tackle shop, always handy in remote locations ! LODGING DETAILS: Estancia Laguna Verde Lodge is strategically located next to the beautiful “Laguna Verde” (Green Lake). The Lodge main building is a typical “Estancia house” accommodating up to 10 anglers per week. It has 7 double bedrooms with comfortable en-suite bathrooms, provided with hot water 24/7, each with 2 single beds. The spacious living room overlooking Laguna Verde is one of the favourite spots in the lodge. Anglers can sip on a cocktail while enjoying, on the 42´ LCD TV set, slide shows of the catches of the day. Satellite TV connection and a DVD player are available for entertainment. A room with a fly tying desk and library are also provided to enjoy when not fishing. There is also a newly built changing room / drying facility located just by the entrance door of the lodge to use before and after fishing. FOOD: Estancia Laguna Verde offers an excellent cuisine made by it's exclusive chef and sous chef. BREAKFAST: Coffee, tea, fruit juices, dairy products, ham, eggs, toasts, freshly baked bread, butter, patagonic marmalades, honey, cereals, and others are available at the lodge for an excellent and energizing breakfast. LUNCH: At noon, anglers enjoy varied menus according to the fishing programs of the day. These substantial lunches consist of grilled meat or trout with salads, picnic of bread, cold cuts, cheese, fruits, and other tasty options. DINNER: Each night the chef prepares a world class 3-course menu each night. In a friendly atmosphere, visitors can try different types of local appetizers such as goat or sheep cheese, dried hams, dried pork sausages, among others. As the main course, anglers can taste our famous “asados” (barbecues), our traditional Patagonic lamb or our classic homemade pastas, just to name a few. For dessert, apart from having a great variety of fresh fruits we also offer different delicacies specially prepared by our chef. The wine selection for the evening varies according to the planned menu. BEVERAGES: The lodge offers a wide range of first-rate beverages from thier famous wine selection of traditional Malbec, Cabernet Sauvignon, Tannat to regional beers, spirit drinks, whiskies, cognacs, etc. These and other alcohol-free beverages are available daily at the bar in the living room. LENGTH OF STAY: Our hosted package at Estancia Laguna Verde Lodge is seven (7) nights / six (6) days of fishing. 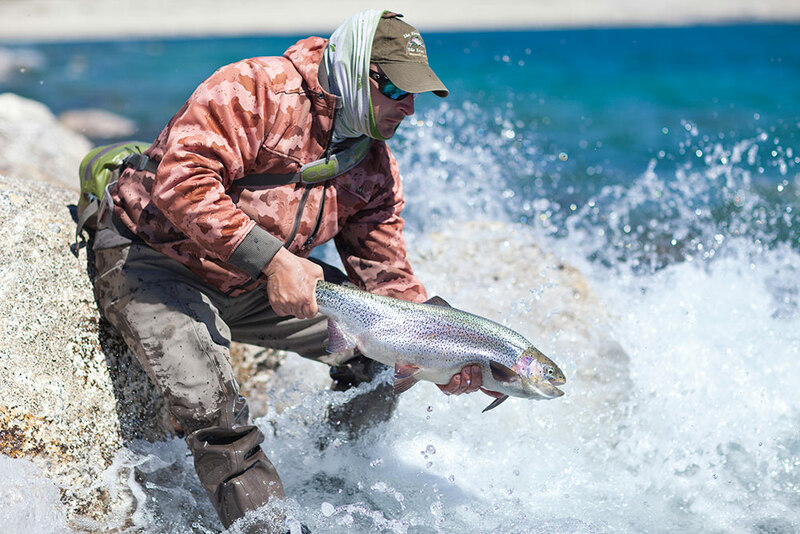 NON-ANGLING ACTIVITIES: Estancia Laguna Verde Lodge is situated in a very remote part of Argentina, and overall, this is a fishing-focused operation. However, with that said, there are a handful of non-angling activities including birdwatching, enjoying the wonderful landscapes, and trekking the remote landscape. GENERAL INFO: Lago Strobel along with the Barrancoso River and Moro Creek offer some of the best rainbow trout fishing on the planet. Estancia Laguna Verde Lodge has access to extensive stretches along the lake shoreline. To change up a fishing day, anglers can pursue rainbows on the Barrancoso River where large rainbows stack up in pools. Since the lodge has exclusive access to 95% river the possibilities of finding fish are virtually endless. 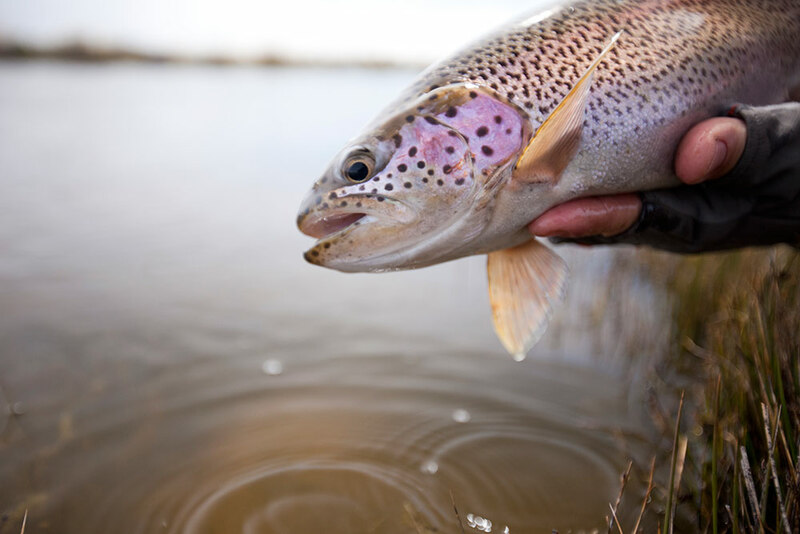 Aside from the Barrancoso and Lago Strobel, Moro Creek offers more than 10 miles river between lagoons that produce rainbows in the 4 – 6 pound range. EQUIPMENT REQUIRED: Almost all fishing in the area is done while wading and fishing from the banks of the lakes or the river. For fishermen traveling to Estancia Laguna Verde, we recommend that you fly from Buenos Aires' Jorge Newbery Airport (AEP) to El Calafate Airport (FTE) in the province of Santa Cruz. El Calafate has a newly-built international airport, where more than 10 flights a day arrive and depart. There are direct flights to El Calafate from Buenos Aires, Bariloche, Rio Gallegos, Rio Grande and Ushuahia (Tierra del Fuego). The El Calafate airport is serviced by Aerolineas Argentinas and LAN Airlines. ARRIVAL & DEPARTURE DETAILS: When possible, we suggest that you arrive the night before the start of your week at the Lodge, which means that you would fly into El Calafate (FTE) on Friday afternoon or evening and then overnight in a local hotel. Saturday morning you will be picked up at the hotel by the Lodge's transfer vehicle and driven to Estancia Laguna Verde Lodge, a trip of approximately 4 to 5 hours. There are a number of comfortable hotel options in El Calafate, some good restaurants, and plenty to see and do, including touring the nearby glaciers. WHAT'S INCLUDED: All accommodations and meals at the Estancia, All beverages and open bar at the Estancia, Fully guided fishing two anglers per guide, All ground transfers from El Calafate City (FTE) to the lodge, Use of wireless internet at the lodge.